Laser tattoo removal is simple, safe, and produces fantastic results. 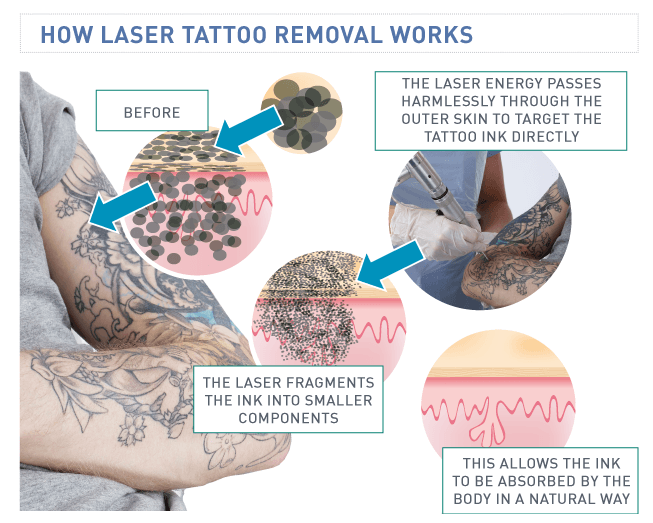 The advanced technology works by allowing the light produced by the laser to pass through the skin and break up the tattoo ink into tiny particles. The body then disposes of these fragments via its immune system. It usually takes several treatment sessions to ensure success, with minimum 4 week intervals between sessions. Using the Allwhite3000 Nd Yag laser, we can safely and effectively remove tattoos, permanent make up, and skin pigmentation such as Nevus of Ota, age spots, sunspots and birthmarks. Tattoo ink particles are too large for the body’s immune system to remove naturally because when tattoo pigment is injected into the lower layers of the skin (dermis) it becomes locked away by a wall of collagen fibres. Q-switched lasers produce very short bursts of high energy laser light. The light is absorbed by the large ink particles, generating heat that shatters the tattoo pigment into minute particles which the body is able to remove. Because the tattoo ink selectively absorbs the laser energy, the surrounding skin doesn’t overheat and there is no lasting damage. What is AW3 ND YAG Laser Q Switched and what can it be used for? ND YAG stands for neodymium-doped yttrium aluminum garnet) which is a crystal that is used as a medium for laser treatments. In Q-switched mode, Nd YAG produces 2 wavelengths, one in the infrared range (1064 nm) and a second beam of 532 nm wavelength which is useful for superficial skin lesions. Q switching refers to the technique of making the laser produce a high intensity beam in very short pulses. We use Nd Yag to safely and effectively remove tattoos, permanent make up, and skin pigmentation such as Nevus of Ota, age spots, sunspots and birthmarks. What skin types can we treat? We can treat most skin types with the Allwhite3000 ND YAG Q-switch technology. If you are in good health (no serious health concerns) and do not have hypo/hyper- pigmentation, tanned or Keloid scarring in your family or personal history. What colour tattoos can we remove? In principle the laser can remove all kind of tattoos. Since all tattoos are not the same in terms of colour, depth of ink deposition as well as their chemical composition some may respond differently. Black, red dark orange and dark blue tattoos will typically respond better to treatment with laser. However Brown, purple, green, light orange, neon and light blue colours are harder to remove and will require more sessions. Customers will see a reduction after the first treatment however to completely remove a tattoo multiple treatments are always required 4-6 weeks apart. With each successive treatment there is more clearance of ink. 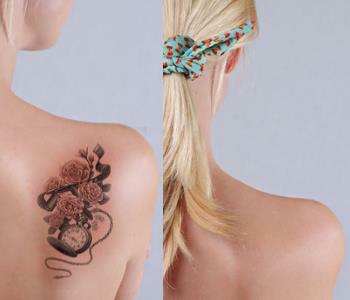 Over time, as the ink is gradually cleared, the tattoo colour intensity and appearance will fade. Am I going to have to take off from work or school? No. Most people go back to work or school same day or next. The only exceptions may be my patients with multiple tattoos, sleeves or very large tattoos. Sometimes these patients choose to take a day off. This depends on the size of the tattoo; a small tattoo might take 5 minutes, where a large, or multiple tattoos could take an hour or more of treatment. Again, the assessment will provide this information. How much will removing my tattoo cost? Tattoo removal is affordable. However, without an assessment of your tattoo and the number of treatments required, I cannot accurately provide you with a true picture of your investment.. Price quotes and phone estimates are good marketing tools not good medicine. I work with patients of all income levels and almost always find a way to help a patient meet their goals. The level of pain felt will depend on the type of tattoos, the amount of treatment required and your own pain threshold. Some clients would describe it as no more than uncomfortable, where others will describe it as an elastic band flicked against the skin. The truth is that you will only know how painful you find it until you try it! We can offer advice on pain relief, which will be given during your assessment. You can apply numbing cream such as EMLA, at home, 1-2 hours before the appointment. Does tattoo size determine the number of treatments needed? No. Most people mistakenly believe that a tattoos size is the most important factor determining the number of treatments needed This is absolutely false. Other factors are much more important. Some large tattoos respond beautifully and some small tattoos are very difficult. Yes. Tattoo artists refer patients to lighten their tattoos before cover up work is performed. This often allows for greater choice in new tattoo design and improves the final result. 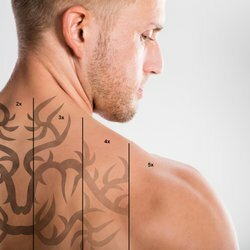 What areas of the body do you perform laser tattoo removal on? The safe and effective removal of a tattoo depends on a combination of the right experience, right technique, and right equipment. There is no one laser or combination of lasers anywhere that can completely remove all tattoos and all colours. It is necessary however to have the right lasers with the right wavelengths to treat all the treatable colours and inks. Many tattoos respond beautifully with 95-99% fading. However, tattoo inks differ in their response to laser treatment and not all tattoos are equally treatable. There is no guarantee. There are over 100 or more tattoo inks in use worldwide today. Not knowing which tattoo ink, how much was used, or how deeply it was placed may make it impossible to precisely estimate the degree of removal possible or the number of treatments required for any given tattoo. The inks colours, physical and chemical composition, its depth and density, as well as location on the body and the person’s skin colour and healing tendencies are all critical factors. To generalise, black ink responds best. Skin pigmentation (tone) is also important, lighter skin responds much better than darker skin. Our Dundee skin and laser clinic benefits from a fantastic central location at South Tay Street. Treatments are carried out by a micropigmentation specialist since 2010. We specialise in Microblading, Semipermanent Eyeliner and Lip Makeup, the latest rejuvenation treatments, pampering facials as well as IPL hair removal and tattoo removal.